I wanted to have a gallery page specifically for the rosettes that I have designed. 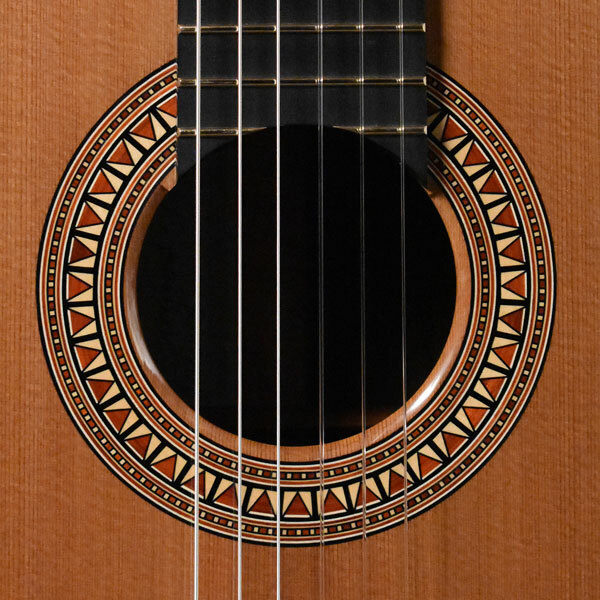 Besides finally stringing up the guitar to hear the fruits of my labors I get most excited about the opportunity to create a unique new design for the ring around the soundhole...the rosette. This definitely adds to the time it takes to complete one of my guitars as 8-10 hours of additional work is not uncommon to design and build the logs required. I have gradually developed techniques to insure more continuous straight lines and I also lay up the logs so that face grain is what is visible in the finished rosette. Though more difficult to assemble because of the fragility of the veneers, face grain exhibits the true color of the wood better while end grain tends to look muddy when finish is applied. Here are a few of my favorites.